Recurve vs. Compound - Recurve Wins! We are having some construction in our office, some walls are coming down, drywall is going up, etc. So our office decided to have a contest, recurve vs. compound. The goal was to shoot through a layer of drywall that was slated for demolition. I was to be the recurve guy. My opponent had an older PSE compound from the 1990s, we think set to 55 lb peak draw, shooting 1914 aluminum arrows (don't know how much they weigh, but a fairly light arrow with a narrow shaft diameter). Result? My arrow blasted through the dry wall and landed about 25 feet beyond the wall. My buddy's arrow failed to penetrate the wall - the arrow almost made it through but appeared to get hung up on the vanes. Cool. I guess arrow weight mattered in this example. The slower the arrow the more it penetrates. I'm just excited about the fact that you can bring your bows inside the office!!! Baby sap do you believe that ? Would a 500 grain arrow at 140 FPS out penetrate a 500 grain arrow at 185 FPS ? Your statement needs clarification. Actually the heavier arrow won. Would have been interesting to shoot the same arrow from both. No Babysaph a heavier arrow at moderate speed out penatrated a lighter arrow at a faster speed. I am guessing at his draw the recurve bow was pulling 68#s, he stated his arrow weight was 750grs (so over 10grs per pound), and I am guessing his arrow speed to be about 170-175 fps. The lighter arrow was traveling faster, what we don't know is if it was tuned to the bow (Personally doubt it. ), even though shot from a lighter draw weight. Bows from that era and that draw weight, I am guessing its speed at around 220fps. Though it was close, the lighter arrow shed energy faster and didn't have enough retained momentum to push the entire length of the shaft completely through. It was actually a pretty good test. The target medium was not designed to stop an arrow as foam targets are that we shoot at. So once the arrow penetrated there was nothing to close around it and stop it. Kinda like animal flesh on a broadside shot, once the broadhead cuts the hole as it goes through the animal, there is nothing to close in around the shaft to slow it down unless it hits thick shoulder bone. Your statement was a slower arrow will out penetrate a faster arrow, which also contradicts your statement just above. A 500gr arrow is a 500gr arrow, no matter what bow it is shot from, it does not need to shot from the same poundage bow. Even if it was some bows are more efficient bow than others, it could also be longbow verses recurve shooting a 500gr arrow. The faster of the 2 500gr arrows will out penetrate the slower one "again all things being equal". There is no way around it. You are shooting in to foam I assume. If the field point on the front end of the carbon shaft is a little bigger in diameter than the shaft, it will take the foam longer to close in around the shaft to start slowing it down, thus deeper penetration. Second thing Carbon has a much smoother surface than woods (plus woods finish becomes tacky when heated on penetration), making it harder for the foam to grip and start to slow it down, thus better penetration. If you have one of those white 2 inch ethafoam targets, hang a zucchini or cucumber on it and shoot it with one of your wood arrows and tell me how much penetration it gets. I will save you the trouble, the arrow won't stop at all in the foam, you will be looking to see where it went. It became lubricated going through either of them, the foam won't be able to grip it to stop it. My buddy and I were shooting compounds and aluminum arrows in the Mid 80's when I did it. If that ethafoam didn't stop that aluminum, it isn't going to stop your wood. Foam targets are design to stop arrows by friction, different factors come into play when shooting into that medium affecting the depth of penetration, has nothing to do with penetration in an animal. 2 arrows shot from the same bow; the heavier arrow absorbs more of the bows energy...so it starts with more stored energy. Of course there are other factors like perfect arrow flight and BH efficiency besides just arrow weight when it penetration. I've seen a bunch of fast and light arrows with mech heads look like they stopped dead in game.....but those arrows on the heavy side with an efficient BH just keep on going. I shoot the same arrow 570 gr from my #70 recurve and an old enough (2004) #60 compound using same tab and same draw length and there is no match in penetration. Recurve loses. The compound sends it 40 fps more and the "slower penetrates more" is against the laws of Physics. Maybe you misunderstood me. Shoot two different weight arros from the same bow and the slower(heavier) arrow is supposed to out penetrate yhe lighter one. All I am saying is that in my experience from my bow shooting a wood arrow and a carbon arrow, the carbon arrow which was lighter out penetrated the wood arrow. My whole point is that there are other factors involved besides the weight of the arrow. The medium you shoot something through does not matter if both arrows are shot into the same thing. Linecutter in reference to your above post. THAT was very well presented. I agree 100%. Thank You!!! 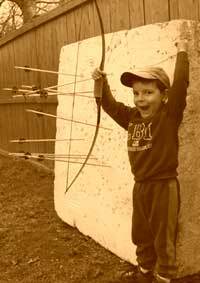 A 40 pound bow can handle any drywall in North America. Oh...a construction site... that makes way more sense then a hunting cabin. "an older PSE compound from the 1990s..."
With all due respect, compounds didn't really begin to routinely outperform recurves until the steel cables were replaced by low- stretch modern string material. Since then, it's not even been close. A 1916 is a light arrow for a 55 # bow it may not have been hitting straight . I like that yunwyia that's funny!!!! A 1980s PSE mach 4 with cables and a B50 could out speed any recurve of the same draw weight and arrow weight. A bear whitetail hunter though was a different matter. I killed a deer with one though.